Your new issue of Private Capital Markets is now available! As we look towards the end of 2015 and a holiday season that is almost upon us, I am pleased to share another edition of Private Capital Markets, the national magazine of the Private Capital Markets Association of Canada. Inside, you will find a series of articles with new insights into financial reporting changes, governance priorities, books and records matters and the challenges of regulatory compliance in today’s environment. Increasingly, our magazine brings to light some fascinating new areas of investment in our broad and diversified private markets. In this edition, we also celebrate the exciting and long awaited news that the Offering Memorandum Exemption will finally be available in Ontario – a huge change for our private markets. The voice and advocacy of the PCMA, supported by others across the industry, was a catalyst for this important regulatory change. 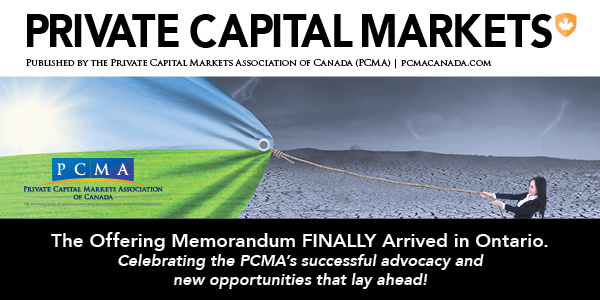 Since 2012, the PCMA has worked with securities regulators to emphasize the need for a robust and harmonized Offering Memorandum Exemption across Canada, and most importantly, for Ontario to catch-up to the rest of Canada. Please share this Magazine and the articles you are most interested in with your colleagues and contacts across Canada – if they aren’t part of our discussion yet, invite them to join your PCMA!